The rise of the strategy ETFs and tactical asset allocation has some worried that exchange-traded funds are losing their ties to traditional indexing. John Bogle of Vanguard says that ETF trading is no way to invest. Barron’s recently penned a piece on how ETFs have become a proxy through which financial advisors can deploy speculative strategies. Of course, an ETF is really just a tool. Used incorrectly, it can burn even the most level-headed investors. Today I wanted to try something new and build a stock portfolio of strategy ETFs with the goal of beating the market. Strategy ETFs use a particular rules-based methodology to select stocks, and some have truly excelled in driving performance for investors. After investigating and writing about ETFs for years, I’ve found a few of my favorite funds, funds that I believe will best the benchmark (the S&P 500 (SPY)) on a total returns basis, and potentially on a risk-adjusted basis, too. There is no guarantee these funds will outperform, but if I had to choose the three funds most likely to do so, these funds would get my thumbs up. Bet on buybacks – Since launch, the PowerShares Buyback Achievers Portfolio ETF (PKW) has delivered returns well above the S&P 500 index (background and performance data) by investing in the companies that have repurchased more than 5% of their shares in the last calendar year. The fund capitalizes on historic mispricing of the power of repurchases, which have been poorly priced through history as the companies that repurchase the most shares tend to outperform those that do not. Another Seeking Alpha contributor showed an example where investors who bought the 100 most active repurchasers in the S&P 500 would greatly outperform the whole S&P 500 index. We’re also fans of its long-term performance. Five year annualized performance of 12% easily beats the 7% return from the S&P 500 index, even with an above-average .6% annual expense ratio. Read more about the Buyback Achievers ETF. Deliver with dividends – Dividend-paying companies have historically delivered above-average returns to investors with less volatility as yields support prices in selloffs, and depress prices in bull markets. One of my favorite dividend funds is the freshly-launched WisdomTree U.S. Dividend Growth Fund (DGRW). Historic returns have beaten the broad market indexes and large cap stock funds. What make it different from other dividend and dividend growth funds like Vanguard’s Dividend Appreciation ETF (VIG) is that it does not allocate a substantial part of its portfolio to low return on capital businesses like utilities and telecoms, which are a large part of other dividend ETFs. In fact, DGRW doesn’t hold a single utility company, which I think makes it more likely to outperform the markets in the long-haul. An expense ratio of .28% makes this a good choice. Learn more about the Wisdomtree U.S. Dividend Growth Fund. Find success with spin-offs – Among the least watched companies are fresh spin-offs. A spin-off breaks an existing company into two pieces, which creates informational inefficiency because the spun-off firm has never operated as a standalone entity, or filed its own individual accounting statements. Thus, spin-offs are often largely ignored by the investing public, which leads to mispricing and undervalued stocks. Over history, spin-offs have beaten their parent companies and the markets as a whole. The Guggenheim Spin-Off ETF (CSD) has more than trounced the performance of the S&P 500 over its short history, performance which I continue to expect from this top strategy ETF. What really powers the fund is that the rules-based methodology mixes well with historical findings. It will only buy spin-offs 6 months after they’ve been carved out from the parent. Typically, spin-offs underperform very briefly after separation from the parent as holders of the parent company sell shares for cash. However, they quickly return to market-beating performance shortly thereafter. See a review of the Spin-Off ETF. Past performance is no guarantee of future results. It should be noted that these funds were selected because years of historical research determines that they have the capacity to outperform. The future can be wildly different than the past, however. Investors who purchase these funds in equal quantities would have a good mix of large and small cap U.S. stocks that would likely beat or exceed the performance of the S&P 500 on a total returns basis. 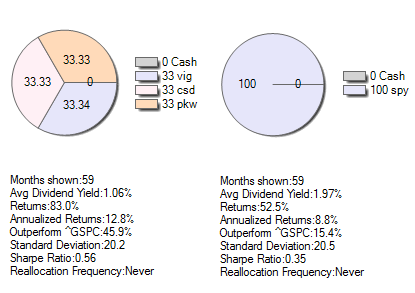 I modeled the 5-year performance of the portfolio using VIG in lieu of DGRW (which is too new to include) and found that the 3 ETF portfolio above delivered exceptional returns vs. the S&P 500 ETF. Not only was the standard deviation of the portfolio performance lower at 20.2% vs. 20.5% for SPY, but the annualized return was also higher at 12.8% vs. 8.8% for the S&P 500 during the same period. Critics will observe the portfolio return and claim that I’m cherry picking. I am. But I’m cherry picking for good reason. The ETFs in the portfolio focus on companies that are actively seeking to increase shareholder value with dividends, repurchases, and spin-offs. Shouldn’t it only be natural that companies who make the effort to increase shareholder value outperform those that do not? I think so, which is why I think this three ETF portfolio can deliver alpha in the long haul.